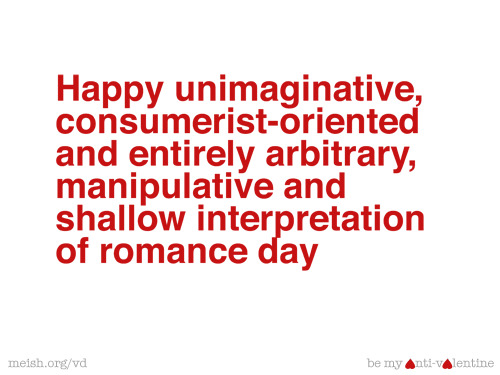 Generally speaking, I hate Valentine's Day. But it isn't because of the PDA, or Hallmark greetings, or abundance of chocolate and flowers. I'm fine with those things- they're cute and romantic. My issue with this holiday is that it exists. That there is a specific day of the year that promotes something that should be done on a daily basis- expressing love for loved ones. "It's Valentine's Day! I will buy so-and-so flowers to show how much I care about them!" 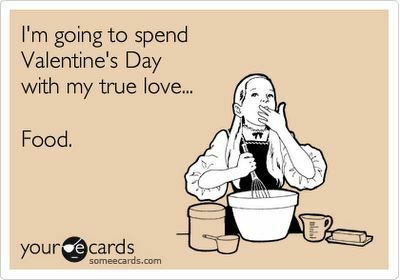 Me: Why does it have to be Valentine's Day for you to do this? Do you not do this mid-July? Why not? If you do, this holiday is just a economic holiday for the flower shops and candy makers so that other people will give treats and flowers too. This holiday is really beneficial for only the markets, because strong relationships shower each other with goofy sayings and stuff all the time. What's worse is that for rocky relationships this holiday can turn into almost an obligatory event that becomes stress for the people in the relationship. Who benefits from it then? The card, flower, and candy companies. Maybe I'm too much of a romantic and I think that the disguise of the essence of love of the holiday should be throughout the entire year, but this holiday really bothers me. Who knows, this may be something that will change for me as I get older, but for now, this is my least favorite holiday. The only benefit is that I get sent chocolate from people.